A typical individual is walking through the mall, looking around for the next store he can go to. He then suddenly shifts his attention to the people walking around him. He notices the majority of them are carrying around a cellphone, or to be more specific, an iPhone. The iPhone seems to be growing more popular as the years go on, however, its competitors should not be forgotten. A phone is only good as its operating system allows it to be. The iPhone 4S and every iPhone after that all support the latest version of iOS, which is Apple’s phone software—iOS 9.3.1, while the iPhone’s primary competitor—an Android phone—runs 6.0.1 “Marshmallow” as its latest operating system. So it all comes down to iOS 9 versus Marshmallow. When comparing two operating systems, major aspects such as customization, interface, and battery life come to mind. Android’s Marshmallow proves its superiority over iOS 9 in all of these features based on personal experience. Let’s start off by comparing how each operating system visually looks. A person will immediately notice the difference between both iOS 9 and Marshmallow just by looking at the home screen. iOS 9 has a clean and organized look, while Marshmallow has a scattered, yet well-constructed, layout (As shown in Figure 1). Here’s where Apple lags behind though: the ability to add widgets—small windows of applications that display information or allow the user to interact with—to the home screen. When iOS 8 first came out, Apple introduced widgets for the first time, however, they were, and still are, limited to the Notification Center. Android, on the other hand, allows its users to place widgets wherever they please. So a person could have a calendar widget on one page and a weather widget on the next. iOS also restricts users from placing apps in the positions they want to, constricting their creativity to rows and columns, whereas Marshmallow allows users to form their own home screen layout design. For example, on Marshmallow, users could place the Facebook app in the top left corner of the home screen and Snapchat in the center. Apple doesn’t allow for that. Another problem with iOS is that Apple forces users to use their native apps for some functions, while Android users can change default apps, such as the mail, weather, and calendar apps, to a different, more favorable one downloaded from the Google Play Store. Figure 1. 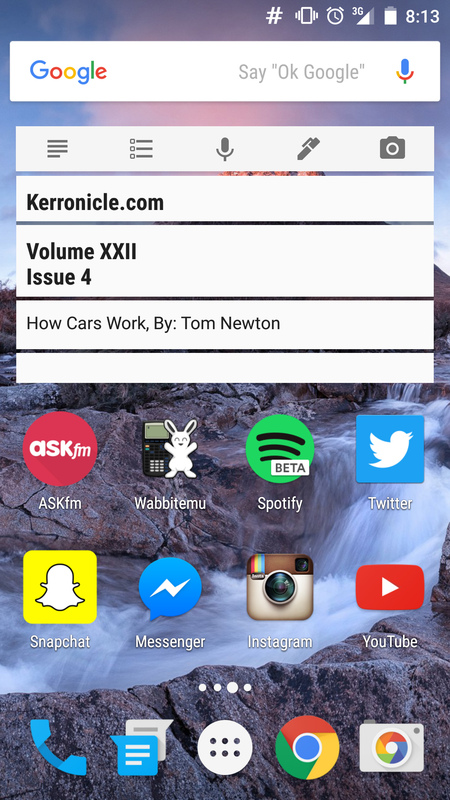 An example of an organized home screen layout on an Android phone. Marshmallow is connected to Google servers, which allows users to sync all their data across multiple platforms. One prominent feature of Marshmallow, Google Photos, allow people to store all their pictures and videos in one place, eliminating the pain of manually transferring media from the phone to the computer. Pictures up to 16 megapixels and videos up to 1080 pixels won’t take up any space on Google Drive, and if users want to add more high quality media, they can buy more storage other than the ten gigabytes that are already given for free. Apple only offers five gigabytes on their cloud service, iCloud. iOS’s Photo Stream only backs up the latest 1000 photos a person has taken; any pictures taken over that number will not be backed up. Not only that, but iOS 9’s Photo Stream lacks the ability to backup videos to the cloud. Both Apple and Android have incorporated a battery-saving feature into their phones. They both lower the processor clock speed. However, Android’s battery-saving features are a bit more extensive compared to Apple’s Low Power Mode. Marshmallow has implemented a new feature called Doze. This allows the phone to detect when it is not being used, and thus intelligently limit the phone’s radio networks, which allows for phenomenal standby times. Another vital attribute in Marshmallow’s battery saving mode is that it greatly cuts down animations. It gives the user the opportunity to sacrifice most of those elegant and smooth software animations for some extra juice out of the battery. It is clear who the winner is. The operating system that stands tall after a worthy fight is Marshmallow—the cornerstone champion. iOS 9 may be superior to other operating systems, excluding Marshmallow; however, Apple will need to come up with revolutionary innovations before the majority of its users begin to realize that the company is pushing the same features on new iPhones each year. Sadly, this doesn’t change the fact that the majority of smartphone buyers in the U.S. will revere all of Apple’s iPhone decisions, no matter how horrible the change—such as removing the headphone jack—and will continue buying the things the company comes up with. 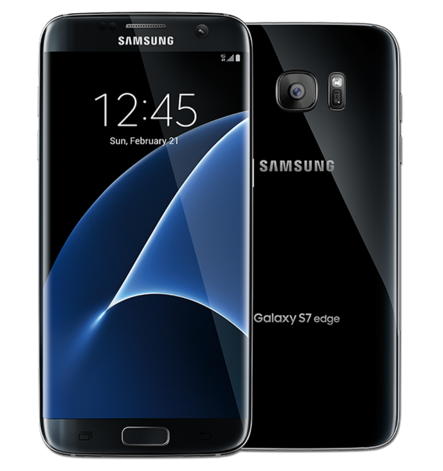 The Samsung Galaxy S7 Edge, one of Android’s top smartphones, has the latest version of Android running. Content and multimedia content © 2019 The Kerronicle. All rights reserved.